Christopher Suprun, a Republican presidential elector from Texas, wrote a column in The New York Times announcing that he would not vote for Donald Trump as President, and urged other electors to "unify behind a Republican alternative, an honorable and qualified man or woman such as Gov. John Kasich of Ohio." 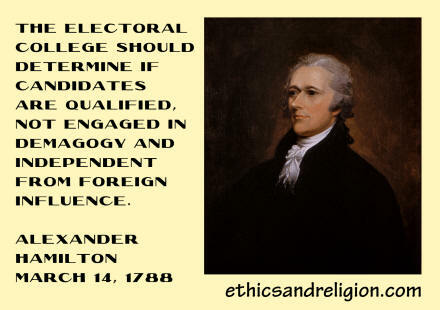 He noted that Federalist 68, a paper by Alexander Hamilton published March 14, 1788, "argued that the Electoral College should determine if candidates are qualified, not engaged in demagogy and independent from foreign influence." America's founders were concerned that a demagogue might persuade the public he should be president, though he might be someone under the influence of a foreign government. Therefore they created the Electoral College as an intermediate step in the election of a President. Each state selects electors equal to its number of Members of Congress and the Senate - but may not be representatives of either house. On December 19, the electors meet in each state separately to vote for the President. Normally, they simply endorse the person voted for by their state. But here are five reasons not to do so. First, Trump is an incorrigible liar. He claimed there were thousands of Muslims in New Jersey cheering the 9/11 destruction of the World Trade Center. There were none. Recently, he alleged that if there had not been votes by dead people, he would have won the popular vote, which he lost by 2.5 million votes. He gave no evidence of that corruption. Second, he had refused to release his tax returns, as all Presidential candidates have for 40 years. Why? The evidence is that he paid no taxes for years - which he does not want exposed. The New York Times reported that in 1995, he claimed a loss of $916 million - enough to avoid federal taxes for 18 years. Asked about it, Trump shrugged and said Hillary should have closed those loopholes when she was a U.S. Senator. Third, his massive tax cuts would add $5.3 trillion to the nation's $20 trillion debt, according to the Committee for a Responsible Federal Budget. And that's on top of the $9 trillion that will be added in the next decade due to the retirement of 35 million Baby Boomers. For example, Social Security is running a $65 billion deficit now and the Baby Boomers only started to retire in 2011. If it is not fixed, all recipients would experience a horrific 23% slash in monthly benefits. Trump's answer: he won't touch Social Security. Fourth, he's immature, unable to control basic emotions. His lack of impulse control prompts him to twitter barbs at any critic. For example, he attacked the cast of "Saturday Night Live," for humor at his expense. Within an hour of Boeing's chief executive questioning his stance on trade, Trump cancelled Boeing's rebuilding of Air Force One. (The only other company big enough to build it is Airbus of Europe.) I shudder his finger will be on America's nuclear weapons. In fact he's asked why have nuclear weapons if we don't use them? Fifth, and most important, he does not understand that the Constitution expressly forbids a president to receive payments or gifts from foreign governments. When Trump met with the Prime Minister of Japan, his daughter was present and later marketed the dress she was wearing in Japan with the help of the Bank of Japan, a government entity. Far more serious was the behind-the-scenes lobbying of Trump by former Senate Majority Leader Bob Dole who worked for six months to establish direct contact between Trump and the new President of Taiwan. As a result of Henry Kissinger's opening of relations between China and the U.S. - America agreed in 1979 not to have diplomatic relations with Taiwan, an island near China's coast. Trump broke that historical precedent by speaking directly with Taiwan's President Tsai Ing-wen which so infuriated China that it admonished the President-Elect in a front page editorial in the People's Daily. Mr. Dole was paid $140,000 by Taiwan's unofficial embassy in Washington. Trump announced Tuesday that a Japanese telecommunication firm, SoftBank, will invest $50 billion in U.S. startups, and introduced its CEO, Masayoshi Son to the press. What will Japan get from the new Trump government in exchange? Trump has investments in 18 countries, which he says will be run by his kids. If these investments are not put in a blind trust, Trump could be impeached for violating the Constitution. A better answer: 37 of Trump's 306 electors could vote for another Republican, denying him the needed 270 to be President.